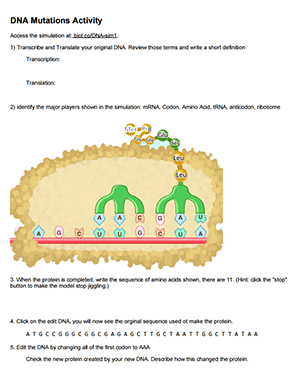 This activity uses a simulation from the Concord Consortium that shows how DNA is transcribed to RNA and then turned into a protein. It’s a very clear animation and can be used on its own as part of a lecture on protein synthesis. The simulation then allows you to edit the DNA which will then create a new protein. 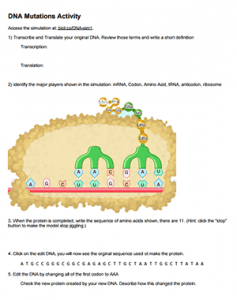 The worksheet asks students to review terms and label an image showing tRNA, mRNA, codons, amino acids, and ribosomes. Students then edit the DNA in a specific way so that they can observe the effects of a point mutation, a frameshift mutation, and a silent mutation. In the point mutation, a single base is changed which leads to a difference amino acid. Students do not need a codon chart to complete this activity. You can also do this activity with the class if you have a projector, this would also allow more discussion on why some point mutations change the output protein and why some are silent. Do you have a teacher key for the worksheet included with this activity? I do not have one made, but I will put it on my to-do list.